Myles F. Corcoran – Myles F. Corcoran Construction Consulting, Inc. I am a licensed General Contractor and certified Building Inspector. My construction experience ranges from finish carpenter to general manager, consultant, arbitrator, and mediator. I first worked in construction in 1972 as a finish carpenter and a plumber’s assistant. In 1980, I returned to construction as a full-time finish carpenter with electrical, mechanical, plumbing, and framing responsibilities with CRW Industries, Inc. I was made field supervisor in 1981. In 1984, I was entrusted with creating and managing a new operation within CRW. I did all estimating, procurement, management, subcontracting, and billing within that operation, on 10 – 30 different construction projects at any given time. In 1986, I opened a second branch of CRW in Soquel, California. My responsibilities included writing all estimates, managing all jobs, hiring, dismissals, insurance, accounts payable and receivable, advertising, public relations, equipment, stock, and general management. I ran up to 32 jobs at once with up to 16 employees. Including all manner of separate construction projects (assuming multi unit work as one project), I had completed approximately 1,600 construction projects, prior to doing consulting work. On April 1, 1990, I started Myles F. Corcoran Construction, Estimates and Consultations, which I incorporated as Myles F. Corcoran Construction Consulting, Inc., on January 4, 1999. I have qualified as an expert witness on many occasions, and acted as Arbitrator and Mediator in hearings. My staff and I interpret building codes and standards as they relate to “as built” structures of a wide variety. We organize complicated construction discords into an easily understandable format. I am a professional construction estimator, specifier, and analyst. My work often includes case merit assessment, documentation review, Code & Standards compliance analysis, estimating and cost analysis, expert negotiations, reporting, exhibits production, and various types of expert witness testimony. I have conducted forensic testing on a wide variety of construction assemblies. I work for a variety of private and professional people who require information which they can rely on as both accurate and presented in an understandable manner. I have years of experience in creating details for the difficult assemblies often omitted from architectural plans: junctures of dissimilar materials, corners, repair-to-original tie-ins, through penetrations, and other transitions. My design focus is customized waterproofing. I am a lecturer on Construction Specifications and Defect Disputes. Throughout my career, I have specified, managed, and assured quality on all manner of construction projects. I have studied hundreds of failed construction assemblies, and understand the basic principles of construction, especially waterproofing and code compliance issues. Currently, my firm works for owners and builders as quality assurance inspectors, identifying issues, and ensuring that plans and specifications are adequate, achievable, and comprehensive. We recommend procedures and materials when necessary. We hold the builder (whether our client or not) to high standards. I have been involved with the analysis of water intrusion issues, damages, and costs of remediation since 1982. The presence of mold in wet/unvented buildings has always been a consideration in this work. My firm is trained and equipped in mold testing, including air sampling and isolation containment area sampling. Our mold and air samples are shipped to a certified laboratory for examination and reporting results. I have advised/consulted in over 1,110 construction cases, the majority of which were disputes. I also have 25 – 30 consultations by phone per year that are completed in the first phone call (i.e., free advice calls). I personally have attended 47 formal Mediations and 35 Arbitrations, as well as numerous expert witness meetings and settlement conferences. I have been deposed as an expert witness 55 times, testified at 14 Trials, and prepared for Trial in many matters which have settled. As Arbitrator, I have heard 72 cases for the CSLB and 3 privately. I have also been privately hired as Mediator in 6 Construction Disputes. I submitted input during the formulation of the first International Building Code. Bachelor of Arts, State University of New York, Oswego, New York, 2002. Attended 1971-1973. Major: Art with Studio Emphasis. Associate in Arts, in Liberal Arts, Suffolk County Community College, Suffolk, New York, 1971. I own, update, and study from an extensive library of construction reference, building codes, standards materials, and trade journals. A complete listing of all continuing education is available upon request. Continuing education includes attendance at seminars, courses, and professional conferences. “Avoiding Construction Disputes,” Presenter, Big Creek Lumber Annual Contractor Conference, 1/26/18. “Top 10 Waterproofing Mistakes,” Presenter, Painting and Decoration Contractors of America (PDCA) meeting, 2/26/15. “Top 10 Waterproofing Mistakes,” Co-Presenter, National Association of the Remodeling Industry (NARI) meeting, 1/21/14. “Construction Defects: Determining Cause & Liability,” Co-Presenter, National Association of the Remodeling Industry (NARI) meeting, 7/9/14. “The Role of the Expert Witness in Developing Testimony & Evidence for Trial,” Co-Speaker, Santa Cruz County Bar Association meeting, 2/15/13. “History and Review of New Building Codes,” Speaker, Santa Cruz Construction Guild meeting, 1/19/12. “Building Codes: History and Overview,” Presenter, Monterey County Bar Association meeting, 9/20/11. “Construction Defects: Determining Cause and Who is Liable,” Co-Presenter, Property Claims Association of the Pacific (PCAP) meeting, 7/21/11. 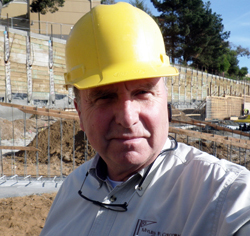 “Top 10 Waterproofing Mistakes,” Speaker, Santa Cruz Construction Guild meeting, 10/21/10. “Looking for Standards for Flanged Window Installation in Drainage Plane Systems,” Speaker, Western Construction Consultants (Westcon) meeting, 10/21/09. Your Future is Our Business, Career Panel Speaker, Watsonville High School, 2009, Aptos High School, 2001, 2002/03, and 2004/05. “Water Testing on the Small Project,” Speaker, Western Construction Consultants (Westcon) meeting, 10/15/08. “Window Weatherproofing,” Speaker, Cabrillo College, CEM 151-Construction Fundamentals Principles and Practices class, 10/22/07. “Traffic Bearing Deck Waterproofing,” Speaker, Western Construction Consultants (Westcon) Symposium, 11/01/07. “What Are Your Options When in a Construction Dispute?,” Speaker, ECHO Central Coast Multi-Resource Panel meeting, 7/11/06. “California Construction Defect Claims,” Preparer and Co-Presenter, Lorman Education Services seminar, 3/12/03. “California Building Codes: History and Overview,” The Barline, a publication of the Monterey Bar Association, Winter 2012. “Value in Defense Testing in Construction Defect Cases,” Pacific Claims Association of the Pacific August/September 2011 newsletter. “Myles Corcoran: Asking tough questions will pay off,” Santa Cruz Sentinel, 4/30/06. View Myles’ CV in PDF format.